Driveways play a vital role in how we access our homes each day. Not to mention they add to our homes’ practicality and curb appeal, which also proves valuable. Planning a successful driveway layout requires that you take into account factors such as size and slope, layout, materials and required maintenance! First, determine the best length and width for your driveway. Standard driveways for residential homes fall in the range of 9 to 24 feet in width. Single-car driveways range from 9 to 12 feet while double-car driveways are typically 20 to 24 feet. The length of your driveway depends on how far away your home sits from the street. Other influencing factors include parking spaces and turnarounds. Turnarounds are usually 10 feet by 20 feet or 20 feet by 20 feet depending on how many vehicles you have and how much room you require in back-up space. Design your driveway to contain the perfect amount of slope that falls in the category of not too flat and not too steep. Completely flat driveways lead to drainage issues when water builds up in the middle and prevents it from running off the sides as needed. Keep your driveway at a less than 15 percent grade so it is not too steep; steep driveways prove slippery and potentially dangerous, especially when wet. Add curves and build up the middle of the driveway where necessary in order to achieve the perfect grade of slope. Your property’s size determines the flexibility of your driveway layout. Smaller properties benefit from straight driveways that create a direct line from the garage to the street. Stamped concrete or framing borders created with shrubbery or trees add intrigue to the otherwise average straight driveway. Curved driveways add curb appeal and functionality to larger properties. They help you easily connect your street access point to your garage when the two don’t line up evenly due to landscaping or other factors. Curves also add elements of character to your property! Horseshoe or circular driveways help eliminate the need for reversing or turning around and are perfect for houses located on busy streets. To select the best material for your driveway, consider your property’s layout and aesthetics. Try to pick a surface that fits in with your surrounding landscape as well as your home’s architecture. The material you choose to form your driveway dictates the required maintenance over the coming years. For example, gravel requires more regular maintenance compared to something like concrete. Determine the amount of time you wish to devote to maintaining your driveway and let that help you decide on materials. If concrete is your style, choose the experts at Templin Concrete Construction to construct your driveway! We have been working in concrete for over 10 years and are ready to plan an efficient and attractive driveway for your home. Give us a call at 612-388-1945 to learn more about our services today! ← What’s Causing My Driveway to Sink and Crack? Asphalt vs. 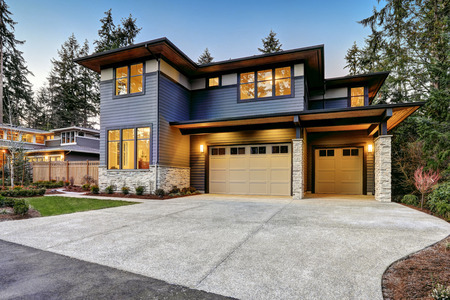 Concrete: Which Material is Right for Your Driveway?